Do you know the key factors that convince people to select a particular moving company? We do! Let’s be honest, it’s impossible for people to “try on” a moving service and it's a substantial investment. So, what factors and resources are most likely to get you more jobs? We recently did a survey to understand how people choose a professional mover. Our survey of 119 randomly selected individuals gives insights on key purchasing triggers for the average customer. When all of the participants were asked which methods they would use to find a professional mover in the future, the results were clear. 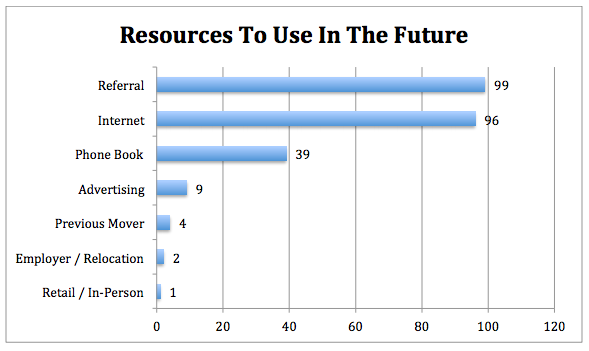 Referrals and The Internet were neck-and-neck (99 and 96 responses), the Phone Book was a distant third (39). Also, 33% of those who selected “Internet” said that review sites were important (Yelp, Angie’s List, Better Business Bureau, etc.). 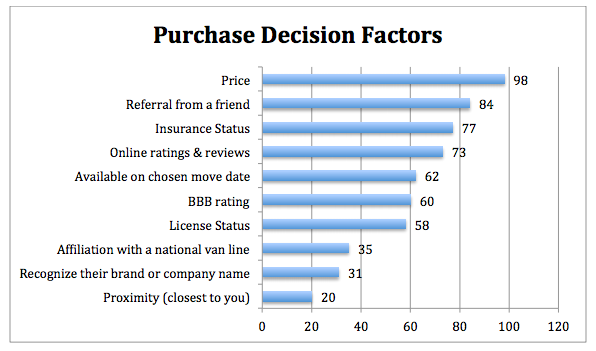 When asked what most affects their decision to go with a mover, Price was the clear winner (98 responses), but Referrals weren’t far behind (84). In fact, 6 of the top 8 factors are about validating mover quality and trustability. Clearly, customers are looking for reassurance when hiring a mover. Along with competitive pricing, it's clear that referrals and online reviews should NEVER be overlooked by moving companies. Establish a solid online review presence and check sites regularly to mitigate any bad reviews. Take advantage of referral opportunities - create a positive experience for current customers. Each and every customer could be the key to a dozen future sales. TIP: Never underestimate the power of a “Thank You” card! FACT: You have to ask! Only 15% of customers voluntarily offer online referrals. RESOURCES: A few templates to use in referral marketing.